Cantolopera is a series that proposes a totally new way to approach the great opera repertoire: versions for voice and piano of the most famous arias, accompanied by a compact disc containing the corresponding orchestral bases, recorded with a 130-piece orchestra, to allow the professional, the student and the opera fan to practice, as well as a version sung by an established artist for reference. Each volume contains the lyrics of the arias plus a short summary and background information on the "Compagnia d'Opera Italiana" Orchestra and the performers. 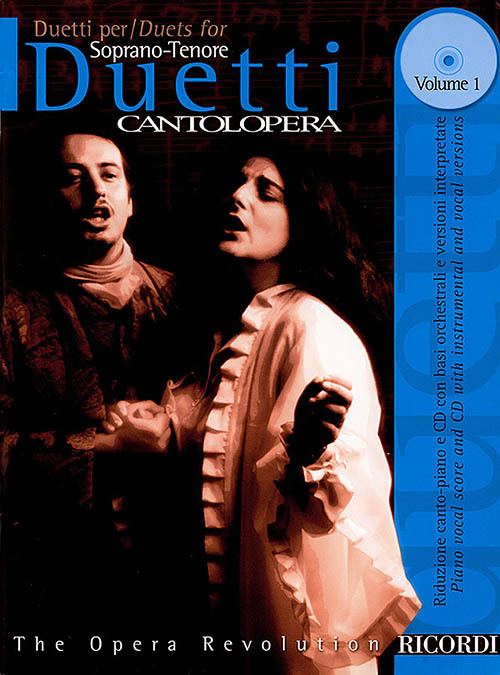 Duets for Soprano-Tenor Volume 1 includes: Parigi, o cara (Verdi) - Libiamo ne'lieti calici (Verdi) - Tornami a dir che m'ami (Donizetti) - O soave fanciulla (Puccini) - O terra, addio (Verdi).